← How can governments and investors be held to account for land deals in Africa? President Mutharika with BBC’s journalist Badawi after ‘Hard Talk’. The President begins talking about land issues at 18 mins 54 secs into the interview. President Peter Mutharika ordered investigations into reports that big name multinationals are grabbing land from poor smallholder farmers to diversify from tobacco farming. Mutharika ordered investigations after reports issued by land rights organisations such as ActionAid Malawi and LandNet Malawi earlier this year indicated that Malawi had entered into an agreement through the G8 New Alliance Initiative to release 200 000 hectares of large-scale commercial agriculture land by 2015. The organisations have said the initiative, which Malawi signed up for, was against the backdrop of proven research that 11 percent of the country’s population has no access to land for subsistence farming. 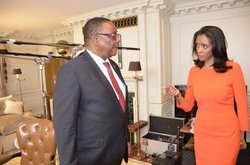 However, Mutharika in an interview with British Broadcasting Corporation (BBC) Hardtalk programme, dismissed such reports.